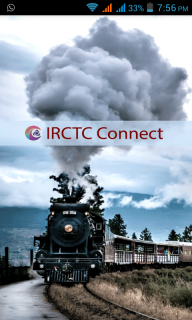 With our increasing dependence on gadgets and the internet for communication, instant messengers are becoming more popular with each passing day. Everyone has gadgets like smartphones and Tabs, which can be used for instant messaging using the internet. Instant messaging sure is the easiest way to converse with friends and family. The most popular instant messaging app of the current age is WhatsApp. WhatsApp needs no introduction as most of us are already using it. WhatsApp was started as a start-up and later acquired by Facebook for whooping $19 Billion. Today, I am going to share an app called WhatsDog that will make your WhatsApp experience exciting and interesting. With a large number of users using the app, it gets really difficult to keep track of details of everyone as when they are online, and for how much duration they stayed online. Though knowing such things are not important, but sometimes we need to spy on a few contacts for various purposes. So, if you want to track someone’s activity on Whatsapp as when he comes only and for how much duration, also how many times he comes online, then you cannot do it without some addon. There comes WhatsDog into the use as it is designed in a way that you can keep an eye over your contact list 24×7. It is fairly simple to use. Sometimes Parents use spy software or Spy apps to track their kids’ activities. For such situations WhatsDog is the perfect app to use without any hassle. So to begin with, you’ll have to install the WhatsDog App from the Google Play Store. Unfortunately, this app was removed from Google Play due to some security reasons. Thus, you have to download apk file from Internet and then use it. You can download WhatsDog here. 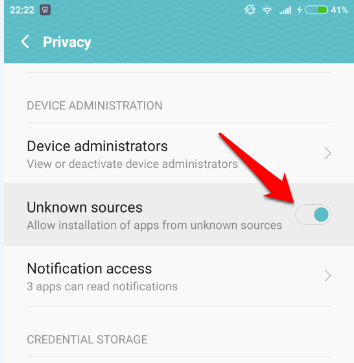 Once you download the apk file, you’ll have to head over to Settings of your smartphone and enable the “Unknown Sources” option from the Security option. Then go to downloads folder and run the apk file to install WhatsDog app. Once the app is installed, launch it by tapping on the icon. The first thing you’ll see when you launch the app is the Start button sitting in the middle of the screen. 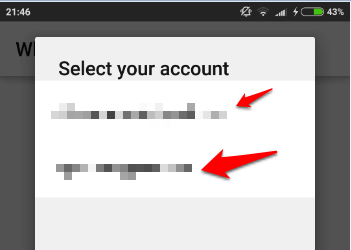 Once you click on the Start button, you will be guided to the next step where you’ll be asked to choose to select one of the Google accounts you’ve signed in with on your phone. Once you do that, you have to proceed to select the contact(s) you want to spy on from your contact list. One of the many good features of this app is that it is not region specific. You can also enter someone’s number who lives in different countries than yours. 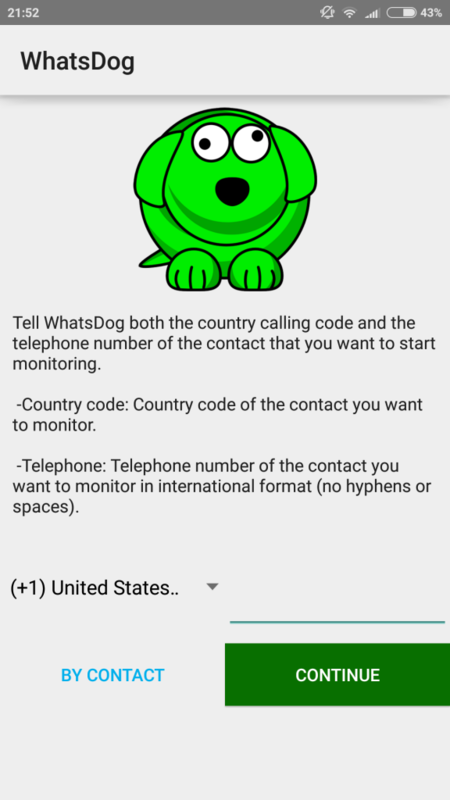 Once you enter the number you want to spy on, WhatsDog starts tracking the WhatsApp activity of that particular contact. It will keep the contact under observation 24/7 and for as long as you want to and will then display statistics based on the data it collects. To begin with, it displays the duration for which the contact has been online using WhatsApp in periods of 24 hours, 7 days and even 30 days. 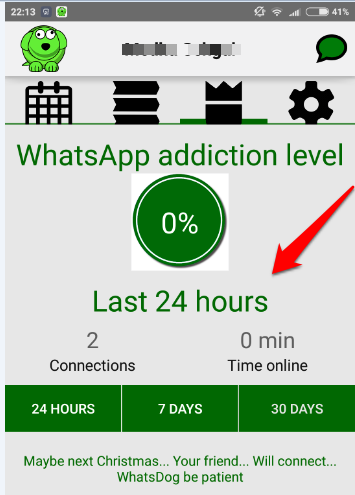 So once you install the app and use it for 24 hours keeping a contact under observation, you will be able to see the duration for which the contact has been online in the last 24 hours. The same can be done for 7 days or 30 days though we kept it to 24 hours due to time constraints. There are 4 menus in the app that can be seen on the top. Calendar lets you see the data for a specific day. This includes the exact time throughout the day when the contact appeared online and also the duration for which the contact remained online. Next is the Main menu which shows the time and the duration when the contact was online on the current day. If the contact has not been online for numerous times during the day, the list will also include details of the contact for the previous day. 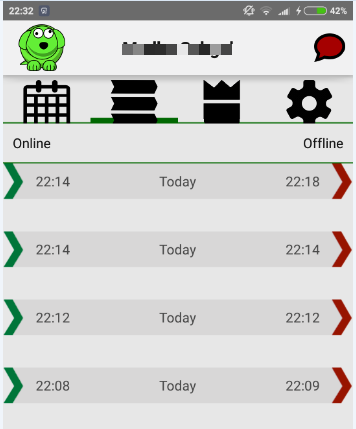 The next menu, which has a crown like symbol shows the duration for which the contact was online during the last 24 hours, 7 days or 30 days. 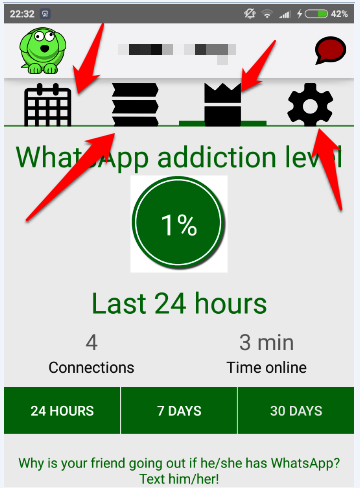 It also displays a “WhatsApp Addiction” stat which displays in percentage the contact’s addiction level to WhatsApp. How do they calculate this percentage? We have no clue. 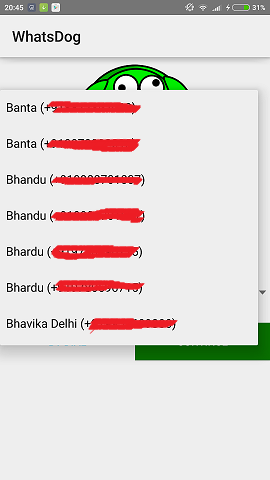 This section of the app also shows the number of times the contact was online or the number of connections made in the selected period of time. The last Menu is the Settings menu which lets you change the settings for the app. The first setting you’ll see is the “Turn ON/OFF notifications” which is unfortunately, unavailable in the trial version of the app. The next setting enables you to silent the notifications about your contact being online for a selected period of time. You can also choose to turn off or on the vibration for the notifications. Below all these settings, you’ll see the Donate option whose function is very clear: donate money to the developers. This in turn will get you some advantages. First of all, you’ll be able to use the trial version even after the trial period. Second, the advertisements in the app which pop-up just anytime will go away. 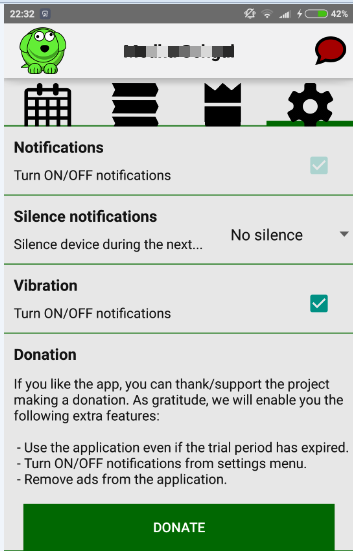 Third, the “Turn ON/OFF notifications” option which was unavailable in the trial version of the app will now be accesible. The last option in the Settings menu is the Delete Info option that allows you to delete all the information associated with the chosen contact and start a new with another contact if you want to. So that was all about the WhatsDog app. Hope this review is useful to you. Feel free to post any queries and suggestions in the comments below and stay tuned for more such informative post at TechTricksWorld. Wow. This is an amazing app. But why was it removed from the Playstore? I am not able to install it on my phone – don’t know if there is anything which I am not doing right. Can you please help? There might be some issues due to which it was removed. But, if you read the post, you can get the download link of its apk, and then you can install the app using the apk. Awesome App.I have Tried To Spy my friends Contact 😀 this was very good app. Great post. This is an amazing app. Appreciated for your work. Great to know that. Thanks for coming by Sherif. Whatsdog sounds funny but the features are amazing, thank you so much for letting me know about this useful app. ive downloaded whatsdog 4.5.8 and its definitely loaded properly and ive followed everything as per your instructions. ive tried it with a few contacts and same happened. help please. im using an android nexus 5. I am not sure of your problem, but this does work with me well, and the same process I have applied. Sad to know this, Shahid. But this trick supposed to work. It was working fine for me. However, I am not using it since a month. There may be some issues, so you can wait 1-2 days and then check again. can you please check it once and let me know whether it is working fine or not? 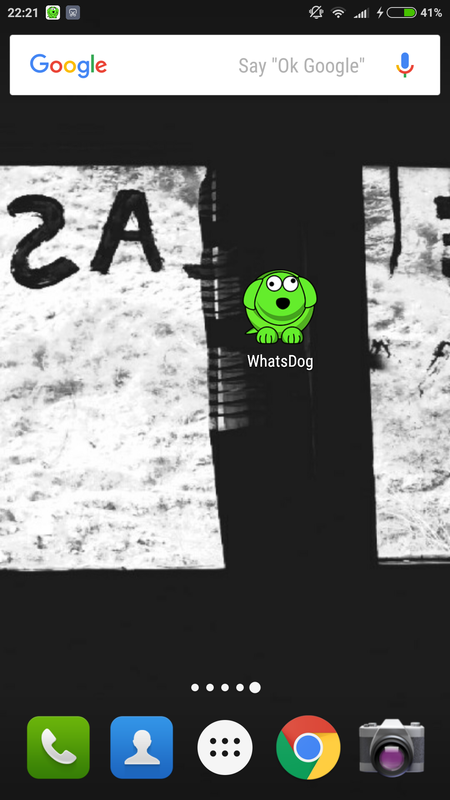 is there any other alternative app like whatsdog?? Not sure about this. I just found an alternative as you asked. There may be many more alternative, you should google them. Hi Atish, whatsdog is not working for the past one week. Are there any problems due to the end to end encryption recently incorporated by whatsapp? The app is now owned by us, but yes I think that may be an issue because of end to end encryption but I am not sure about it. It did work in the past for me too. It definitely appears that Whatsapp has done everything possible to stop Whatsdog from functioning for security reasons just like how Playstore has removed it. We can only hope that the developers find a way to get past these blockades. Yes John, looks like that only. Lets hope for the best. We have used it on Android. I am sure it might be available for iPhone too. Did you try finding out on the app store on over Google?